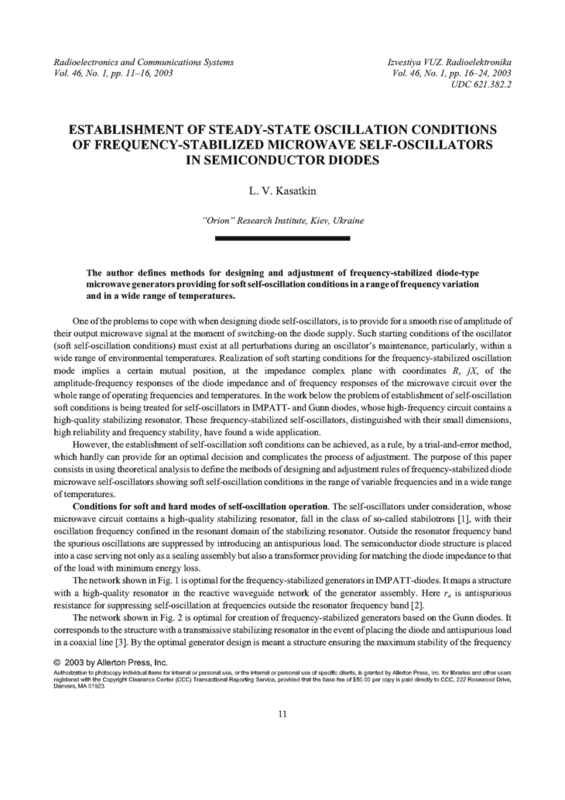 The author defines methods for designing and adjustment of frequency-stabilized diode-type microwave generators providing for soft self-oscillation conditions in a range of frequency variation and in a wide range of temperatures. BROWN, W.C. "Platinotron increases search radar range," Electronics, n.8, 1957. KASATKIN, L.V. ; SATSKOV, V.A. "Optimizatciia stabilotronnoi skhemy GLPD," Elektronnaya Tekhnika, Ser. 1, Elektronika SVCh, n.1, p.10-16, 1979. VAN DER HEYDEN, B.F. "Design of stable, very low noise, cavity-stabilized IMPATT oscillators for C band," IEEE Trans. Microwave Theory Tech., v.25, n.4, p.318-323, 1977. DOI: https://doi.org/10.1109/TMTT.1977.1129094. BLAQUIERE, A. Nonlinear System Analysis. Academic Press, 1966. LUGOVOY, A.A.; KHOMENKO, S.V. ; CHAIKA, V.Y. ; TSVIRKO, Y.A. "Nekotorye osobennosti nelineinykh harakteristik generatorov na diodakh Ganna," Elektronnaya Tekhnika, Ser. 1, Elektronika SVCh, n.6, p.5-9, 1988. KASATKIN, L.V. ; CHAIKA, V.Y. ; SHVACHKA, A.V. "Harakteristiki korpusirovannykh diodov Ganna v generatorakh SVCh," Elektronnaya Tekhnika, Ser. 1, Elektronika SVCh, n.2, p.6-11, 1989. BELOUSOV, N.P. ; NOVOZHILOV, V.V. "Temperaturnaia zavisimost dinamicheskikh harakteristik impulsnykh LPD," Elektronnaya Tekhnika, Ser. 1, Elektronika SVCh, n.3, p.23-26, 1987.